Steve Berman’s young adult novel opens with all of the elements for a clichéd teen horror movie: alienated goths, check; nearly Halloween, check; and an ouija board, check. But he promptly destroys a reader’s expectations and gives me one of the best YA novels I have read to date. The high school’s star athlete has haunted a stretch of highway since his untimely death in 1957. Enter the novel’s nameless 17-year-old protagonist who has come to terms with his fledgling sexuality, but is caught up in the angst of finding his first love. Boy meets ghost. And then the trouble begins. This book continues to stay with me more than a year after first reading it. The main characters are believable and inhabit Berman’s detailed landscape with an unwavering presence. (Perhaps the ghost wavers in and out a bit, but that is a ghost’s basic physiology.) The storyline is taut and hums along from beginning to end. At 204 pages not a word or scene is wasted. To Berman’s great credit, he ends the novel with possibility, but no promises. A great ghost story aside, what lurks underneath it all are the horrors of everyday life for LGBT youth. Rejection by family and the inevitable alienation from peers are common realities for numerous gay and lesbian teenagers. Even if a teen comes to terms with his or her sexuality, there are the feelings of isolation for many. These issues were present in the story without overwhelming the supernatural elements. This is not a coming out story so much as a coming of age tale. 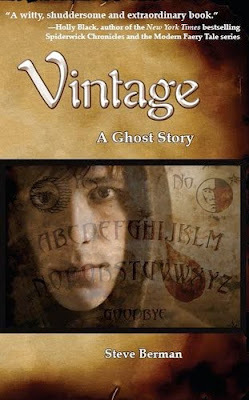 It manages to give its reader a satisfying ghost story with some romance and redemption along the way. Most importantly, it digs out new territory in the YA genre with terrific writing. I wish this book had been around when I was coming out during high school in a rural community. I know it would have made a difference then and will continue to do so. Great Review, Jory! I've heard about the book before but have yet to seek it out; now, I'll be making that my mission! Love this book!! Read it in 2007. Wasn't really a "young adult", but I was "younger" at the time. :-) I am including this as a related article on my own blog post. Pulling Up Stakes and Heading...East?